Please note that for the Riser card in 1U/2U case to function properly, the slot that is exactly 7.2"(B-position slot) away from the keyboard side has to be "correct" slot type or you will have to purchase a riser card with Ribbon cable. 1U case requires Low-profile CPU cooling fan that cannot exceed 1" in height. To understand better how to decide which riser card to use for you MB, you have to know the way slots are positioned (numbered) on your MB. The picture shows you how the slots are numbered. Many mainboards don't have any slot in position 7 but MOST Mini-ITX MB’s do. The riser card in 99% of the chassis out there is plugged into position 6 although there are some exceptions in some unusual chassis. So the first step is to decide what kind of slot(s) on your MB the riser card needs to be connected with. A 2U riser card may use 1 slot, 2 slots, or 3 slots from your MB. 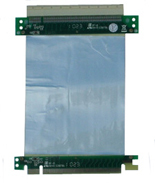 We have some special riser cards with ribbon cable(s) that can reach slots in different positions like 2, 3, and 6(or 7, 5, and 4), etc. Be Careful! Please see pictures below for reference before ordering your Riser card! Short AGP slot is 3" long, long AGP slot is 4.25" long! If your 2U case has 3-horizontal slots like the upper slot in the picture, the rear window is a 6th window. If your 2U case has 3-horizontal slots like the bottom slot in the picture, your case has a 5th rear window! 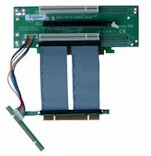 Our 1U/2U riser cards are based on 6th rear window! If you do NOT find any riser card that works with your MB, pls call us at 909-839-2886 and we may be able to customize a riser according to your need! 2U Riser 2 x 64-bit + 1 x 8X PCI-Express for X6DHD MB, etc.